The island of Maui is part of the state of Hawaii. 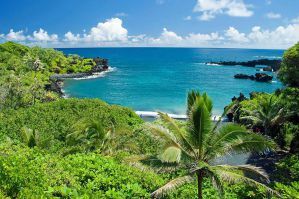 Maui is the second largest of the eight major islands and it's a popular travel destination for it's beautiful beaches, interesting towns, and stunning natural landscape. Lahaina is the most popular town on the island and it is the only town that has a decent nightlife scene. You'll find most of the island's hostels and budget accommodation in this area. The town is on the western edge of Maui and it is the gateway to many of the island's beach resorts that are found just to the north. The town itself is 5.8 square miles with a population of just under 10,000. How much do hostels in Maui cost? A good hostel for backpackers, surfers, and solo travellers. The Tiki Hale is a great option in Maui, Hawaii for backpackers and budget travelers. It's built around a Tiki Garden and it is conveniently located by the beach in Lahaina. The hostel is on Front Street, which is one of the most popular streets in Maui. It's known for its shops, restaurants, and tourist sites and it's a great place to base yourself during your time here. The hostel is also by the beach, near one of the best surfing spots in Lahaina. You can literally get from your room to the surf in less than a minute. This hostel is a fun and affordable place to stay that offers guests access to everything that Maui has to offer. If you want to enjoy the area's wonderful water sports and outdoor activities, there are surfboards, boogie boards, snorkeling equipment and beach chairs that you can use. There are also bicycles available for rent that you can use to explore the island. If you have any questions or need help arranging activities, there's an activities desk where they can answer all of your questions about local events. The hostel has private twin rooms available as well as four bed dorms. Dorms are either co-ed or female only and all rooms, including privates, use shared bathrooms. The best party hostel for backpackers, solo travellers, and surfers. Banana Bungalow Hostel is THE party hostel to stay at in Maui. It's one of the most popular hostels on the island and you're sure to find a crowd of young travelers here looking to have a good time. The hostel offers all kinds of activities for guests. There are free daily tours of the island, regular Happy Hours, and Monday night keg parties every week. There's also all kinds of amenities available for guests including free internet access and wi-fi throughout the hostel. There are many great places where you can hang out with other guests. There's a large jacuzzi and a beautiful tropical garden where many guests spend time. There's also a pool table, ping pong table, dartboard, and a television room available to guests. Banana Bungalow Hostel is popular with backpackers, surfers, and travelers from around the world. It attracts a young and fun crowd and you can be assured you'll make a few new friends while you're here. The atmosphere can't be beat and you're sure to have a good time. If you want to get out and explore the island, the hostel also organizes all kinds of hikes and tours. There is a twelve mile Haleakala Volcano hike, Iao Valley Rainforest hike, and others to choose from. There's also whale watching trips available during the peak season, and snorkeling tours where you can see sea turtles. There are tours of historic Lahaina and Paia towns, and all kinds of water sports lessons. Whatever your interest, you're sure to find an activity you'll enjoy here. The hostel has single, twin, double, and three bed private rooms as well as two and four bed dorms. A quiet and fun hostel that is good for solo travellers and backpackers. 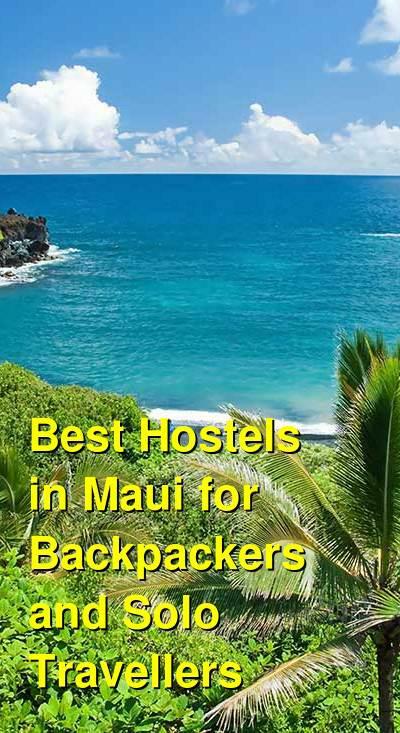 The Northshore Hostel in Maui is another popular option with backpackers and budget travelers. It's a friendly and comfortable place to stay that is affordable and reliable and it's a great place to relax in your own little piece of paradise. The hostel has a wide variety of private rooms available. There are singles, twins, three person, and four person rooms. Every room uses shared bathrooms, and while the rooms are basic, they are comfortable. There are also dorms that sleep up to eight people and are split by gender. This hostel also has shared kitchen facilities which guests can use. The wi-fi connection is good and there's a social environment where it's easy to meet other guests. If you're hoping for a good night's sleep, they do strictly enforce the 10 pm quiet time, so anybody looking for a party must leave the hostel grounds. The hostel is a bit removed from the island's main sights and attractions so it helps to have access to a car. There is a shuttle every morning that goes to the beach and there are some buses that travel around the island. In general, a car in Maui is a must though.